Although it’s hard for many people to remember due to the extremely cold and snowy weather (hi, polar vortex), spring will be here in just a few weeks. This might not mean much to states that never get snow, or should have gotten snow, but didn’t (hi, California), but to a lot of people, this simple demarcation means they made it. Snow will continue to fall in March and maybe even April, but it’s spring snow. And spring snow is good for flowers, right? It’s the idea of rebirth, renewal, and refreshing oneself. There’s Easter, Ostara, and lots of other ways to mark the coming of spring. One of the more practical ways to mark the coming of a new season, and what might also be called tradition in many homes, is spring cleaning. While everyone has their own ideas about what spring cleaning means, every culture has something with regard to how you can change, or even improve, where you live with a shaking off of winter’s chill. Again, this is probably more popular where it gets cold, and it isn’t necessarily all in March or April. Still, if you’ve been tracking in dirt, leaves have been sticking to your shoes, and winter clothes are piled up for easy access, it’s time to think about cleaning house. Along the lines of cleaning house, shaking out the drapes, and getting ready for some warm weather, adding to or improving the home itself is an annual event. Rites of spring can be a many tiered event. Maybe it’s the cold, but showers and baths are longer during the fall and winter, which means you’re spending more time in the bathroom. Whether you’re simply soaking in your bathtub or luxuriating in a steam shower, it gives you time to look around and really take in the room. Are you happy with it? Maybe it’s time to update the bathroom in part or in whole. Regardless, it’s time to change. Chalk up this change to the Wheel of the Year making another partial revolution. Things age, fall apart; people grow, evolve, and want different – and new – things. What seemed like a perfectly reasonable traditional room when you moved in might now be better suited as a modern room. When thinking of updating or renovating your bathroom, think of form and function. Where is the eye drawn, and what do you want to be seen? 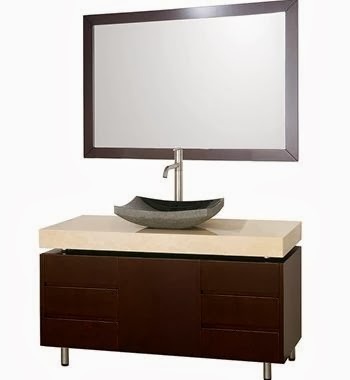 One of the central pieces in any bathroom used daily is the vanity. This is usually a focal point, as well. Vanities come in many different forms that are perfect for whatever size bathroom you have. Half baths and master bathrooms both need a vanity. We use them as storage, counter space, as a base for the sink, and all of these combined. Vanities are one of the most versatile pieces you can have in your bathroom. Wall mount or floor mount options depend on your preference, as do the addition of double or single sinks. They can be matched to compliment mirrors and medicine cabinets directly above them, giving the area, no matter how small, a way to stand out. The variety of finishes and colors allow homeowners to go with a theme or make the room stand out separate from all other rooms in the home. Spring cleaning and bathroom renovation wouldn’t be complete without considering your bathing options. If you live in a house with a shower and tub combo, but have never used the bathtub (or only use it rarely), perhaps it’s time to upgrade to a walk-in shower with body spray jets. Timers, aromatherapy, and massage are only some of the options here. On the other hand, maybe you want to increase the function of your bathtub because you enjoy soaking in it regularly. Soaking tubs are made for this activity, and also include jets as an option. This turns soaking in a tub into more of a luxuriating experience. Depending on the size of your bathroom, you might even have the room for both a walk-in steam shower and a soaking tub – or even whirlpool. Like vanities, tubs come in a variety of styles to fit with your traditional or contemporary ideas. There are many solutions to bathing and beyond when it comes to bathroom renovation ideas. For how long it seems the cold sticks around throughout the autumn and winter, it’s important to keep in mind, if only to ease your mind, that spring will come. As surely as the sun will rise, a new season will come and bring with it possibility. Whether it’s because we’ve opened the curtains and windows to let the sun and warming air in, we also grow expansive in the way we see our living space. As you consider what to give up, give away, clean out, and square away with the approach of spring, consider how things might change with a bathroom renovation. Let the light in and see what happens.